In the opening scene of the iconic movie of the 1960s, The Graduate, Benjamin Braddock, at a party to celebrate his college degree, is given one word of advice for his future: “Plastics.” Were young Benjamin to be receiving that advice today the word would be: “Batteries.” Steve Visco of Berkeley Lab’s Materials Sciences Division had plenty of encouraging words for young graduates on the opportunities to be had in next generation battery research. Speaking at the recent national meeting of the American Chemical Society in New Orleans, Visco discussed the enormous progress his own start-up company, PolyPlus, has made in developing lithium-metal batteries with unprecedented energy density, and how the ever-growing need for electrical energy storage will require continued innovation and development in battery research. The main challenge for battery science has always been to maximize the amount of stored energy while maintaining stable electrode-electrolyte interfaces. When Visco began his battery research at Berkeley Lab in the late 1980s, the gold standards in rechargeable batteries were nickel-cadmium and lead-acid. In 1991, Visco and colleagues including Lutgard De Jonghe, also with Berkeley Lab’s Materials Sciences Division, formed PolyPlus, based on promising science with lithium-sulfur batteries. Shortly thereafter, Sony released the first lithium-ion batteries and a new gold standard was set. Visco and his colleagues at PolyPlus rose to this new challenge with a major breakthrough of their own, the protected lithium electrode (PLE). The PLE technology enabled the PolyPlus lithium-water battery to achieve the highest energy density ever recorded at 1,300 watt-hour per kilogram – several hundred times better than the maximum delivered by present day lithium-ion batteries. The key to the PLE technology’s success is the use of a water-stable, solid-state, lithium-conducting membrane to shield the lithium metal core from the external environment. Lithium is lightweight and has an excellent electrochemical potential but is so highly reactive it rapidly corrodes upon contact with water. With the PLE technology, the lithium metal anode is sealed within a membrane that lets lithium ions pass through but keeps out water and air. The PLE technology has won PolyPlus extensive recognition, including selection by TIME magazine as one of the 50 Best Inventions of 2011, a 2012 Edison Award and two grants from DOE’s Advanced Research Projects Agency-Energy (ARPA-E). However, while the technology has addressed the reactivity problem for lithium-metal batteries, rechargeability remains a major hurdle. Whereas lithium-ion batteries can be recharged thousands of times, the best lithium-metal batteries can only be recharged a few hundred times. Progress is being made, however. “PolyPlus has developed 8 amp-hour capacity primary lithium-air cells that deliver more than 800 watt hours/kilogram and we’re making excellent progress with rechargeable lithium-air batteries,” Visco said. 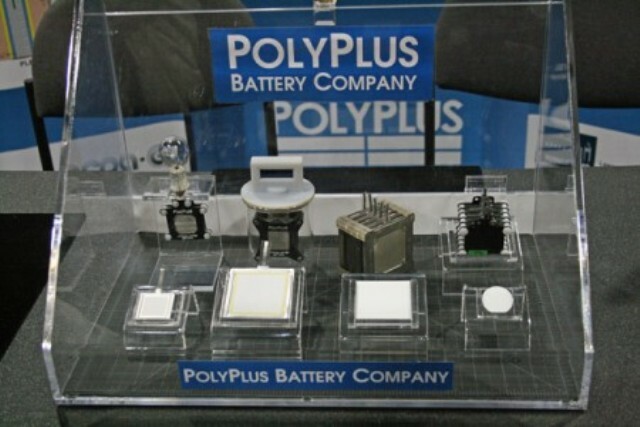 PolyPlus has also announced the development of a revolutionary aqueous lithium-sulfur battery for which it won an ARPA-E grant. PolyPlus expects to market the world’s first rechargeable aqueous lithium-sulfur battery within the next three years, followed by introduction of the rechargeable lithium-air battery.